Another Long Walk: To Sisters! wagon road just to the right of today's highway. What a fabulous day! I had a couple of things to look forward to today. 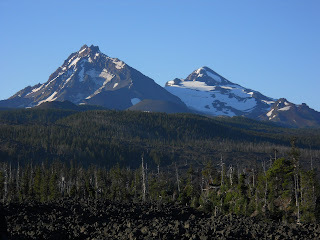 I woke up to a beautiful, clear sky, just south of McKenzie Pass--another location mentioned in Hiking Oregon's History. 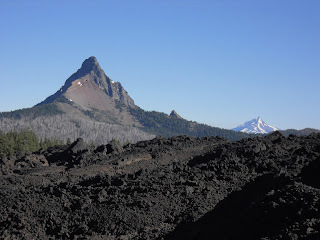 This particular hike describes the Dee Wright Observatory and an old wagon road over the pass, but the hike itself is on the PCT itself, hiking north out of the McKenzie Pass. I arrived at McKenzie Pass and hiked the quarter mile up Highway 242 to the Dee Wright Observatory--a beautiful stone structure with viewpoints pointing out the distant mountains. The location was off the PCT, and I didn't really expect much, but it was a mere quarter mile off the trail so I figured why not? Not like I'd be doing a ten-mile hike out and back like I did yesterday! The observatory was far more impressive and interesting than I ever imagined, though, and signs explained the geology around the area. 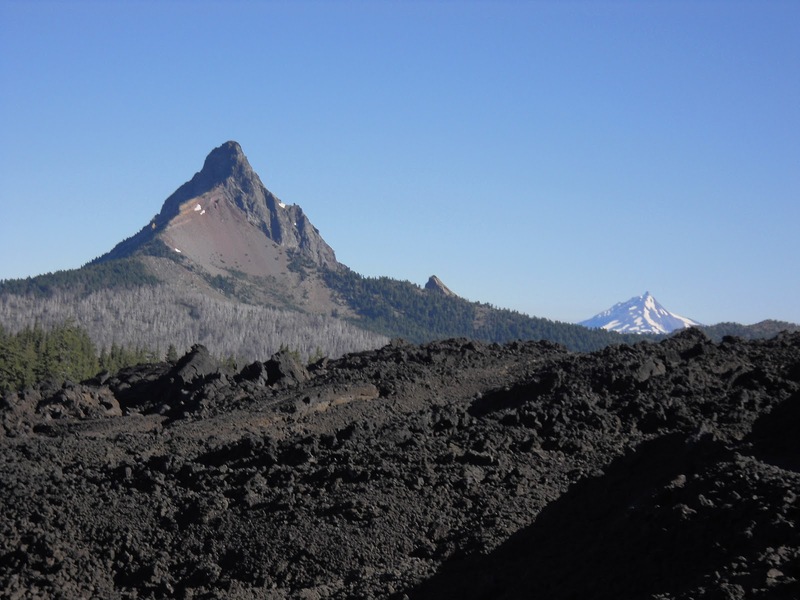 It doesn't take a geologist to know we were located on a relatively recent lava flow. Vegetation was all but non-existent, and the hardened lava cooled and solidified into a desolate red vastness. I imagined it looked much like terrain on Mars--not that I have an experience hiking on Mars or anything. It was this very lava field that made Scott decide to route his wagon road south over Scott Pass (following today's Scott Trail, which I hiked yesterday). 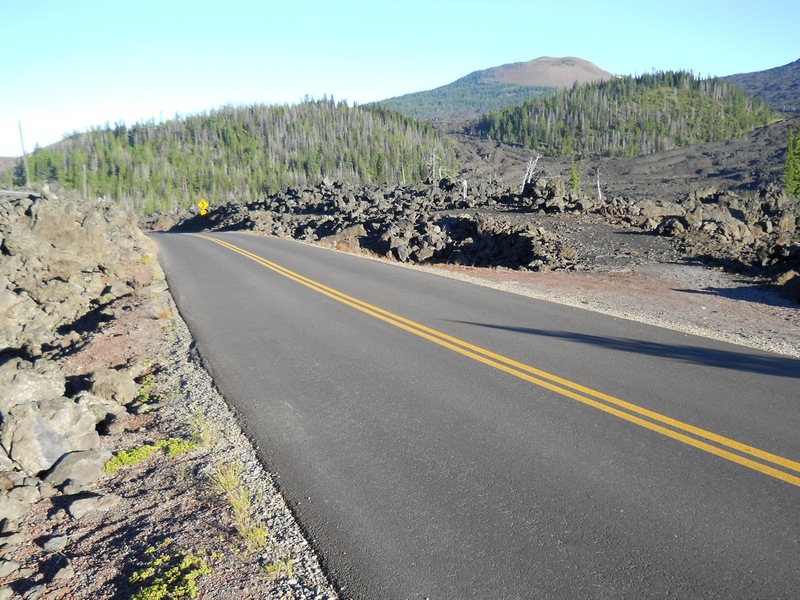 The road over McKenzie Pass was created several years later by John Templeton Craig who felt the lower elevation of this pass was better. 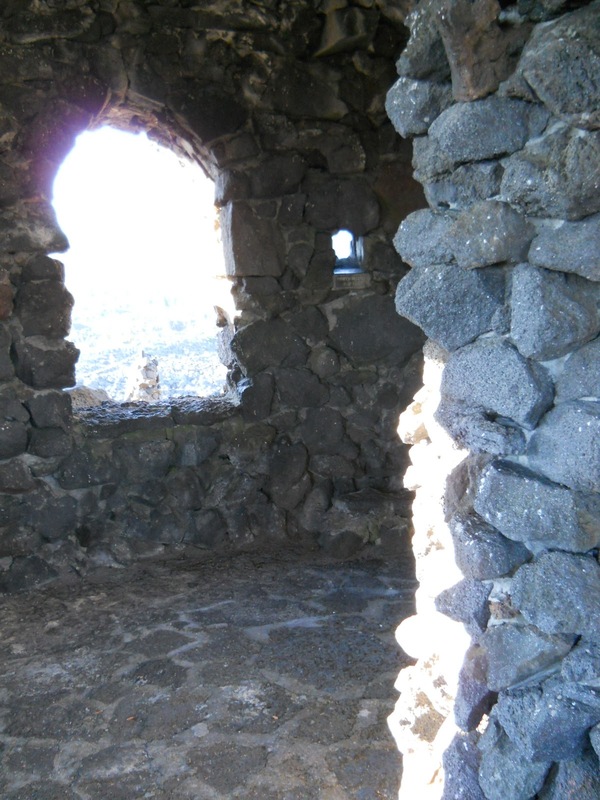 He chipped a road through the ragged lava and opened a toll road in 1872, charging two dollars for a wagon, one dollar for a horseback rider, ten cents for cattle, and a nickle per sheep. Craig believed so strongly in his road, that he insisted it could be kept open, even in winter. When a post office opened in Camp Polk on the east side of the pass, Craig bid for and won the contract to shuttle mail across the pass all year round. It was just after Christmas of 1877 when Craig shouldered his mailbag and set out, alone and on skis, never to return. Blizzards turned back rescue efforts six weeks later. A second search party found his frozen remains, wrapped in a quilt, at a shack he had built at McKenzie Pass. Why he died is still a mystery. Had he been unable to find firewood? Was he unable to start a fire? Was he overcome with an illness? Nobody knows for sure, but he was later buried two miles west alongside Highway 242, the route that he pioneered and championed. The county bought the road and eliminated the toll in 1898. 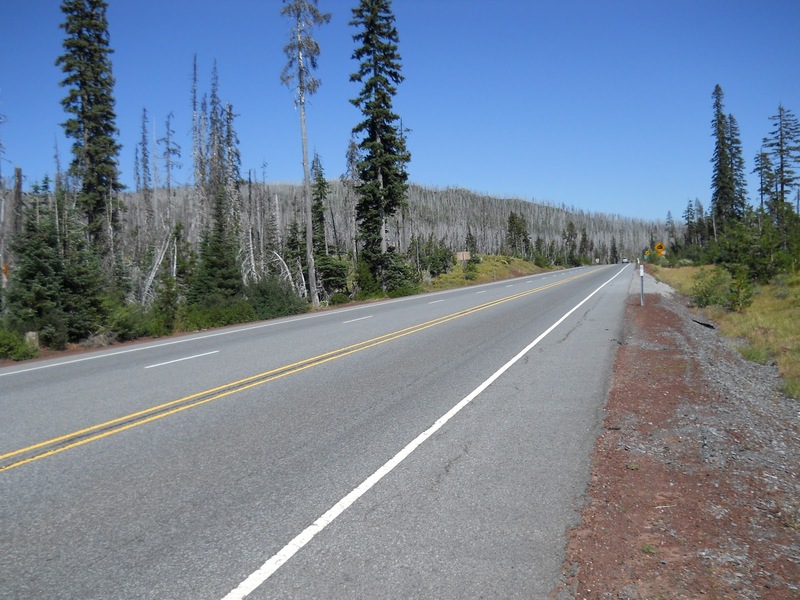 The state took over in 1917 and built the present day highway--the first paved road across the Cascades. Even today, the winter snows cause problems, and snowplows give up trying to clear the highway by about Thanksgiving. And every year since the early 1930s, cross-country skiers assemble for the John Craig Memorial ski race across McKenzie Pass. On a weekend in early spring, hundreds of skiers set off on the snow-buried highway. 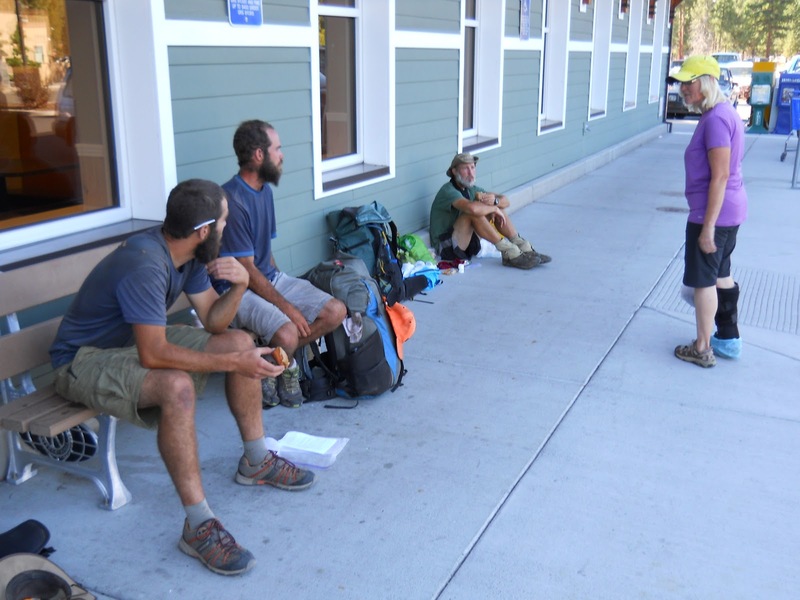 In the Craig tradition, they carry letters twenty-two miles across the pass. Racers compete for speed, but they are also careful to protect their mail, stamped in the Sisters post office with a commemorative cancellation mark prized by collectors. 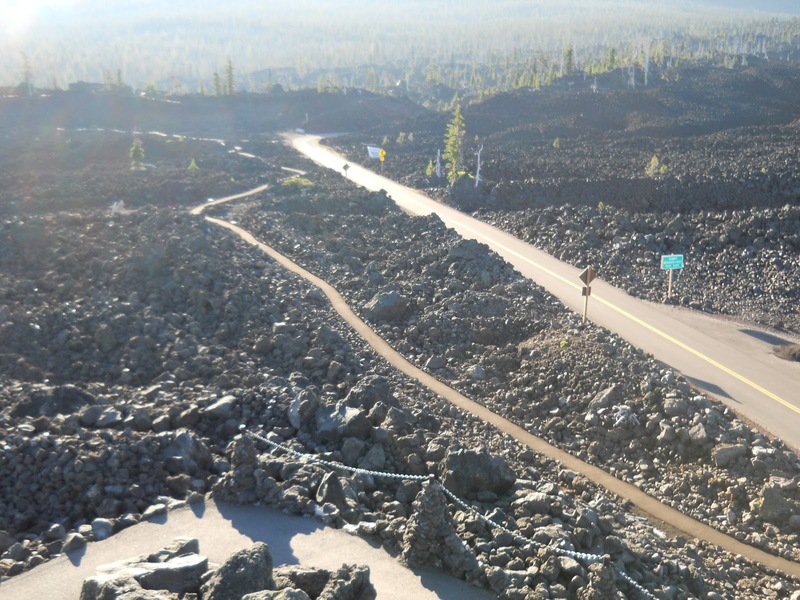 I followed the half-mile Lava River Trail through the lava field, completely alone except for the occasional car that would drive by. Most thru-hikers going into Sisters hitch a ride from this pass into town, but I had decided to try my luck at the next pass and was now glad of that. I could count on one hand the number of cars that drove past. It could take a long time to hitch a ride with that kind of traffic flow! aimed at South Sister, if I remember correctly. at prominent points on the horizon. The other reason I decided to continue on was that my pack was practically empty of food, and I decided the idea of doing the next ten miles with a very light pack was far better than to come back with a heavy pack loaded down with food. If I was completely out of food, I might have tried to hitch a ride out of necessity. 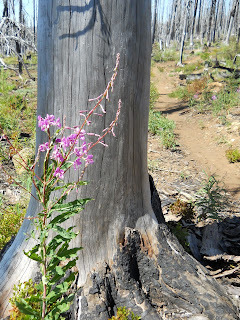 But there was no necessity, so I walked back to the PCT and continued on. I noticed that the PCT followed the original path chipped out of the lava by Craig for a short ways, parallel to today's highway. It seemed a shame they didn't put up a sign by the old road bed at this location. Most thru-hikers passing by will likely ever know the story behind it. Late in the morning, I passed a momentous milestone: two thousand miles. I had hiked two thousand miles since leaving the Mexican border. 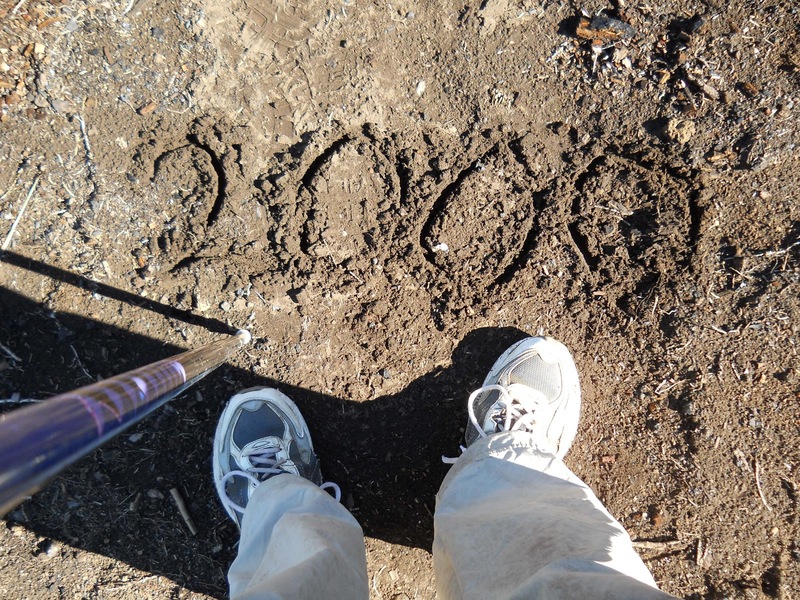 There's no sign to mark the location, so when I reached a point I thought was likely the right location, I wrote 2000 in the mud with my trekking pole (the ground was still wet from the rainstorm two nights before) and took photos. I considered making a more permanent marker with rocks, twigs, or pinecones, but I was feeling lazy and there wasn't much of any of those materials around anyhow. 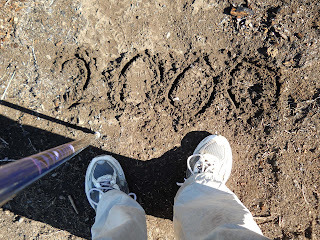 And anyhow, for all I knew, someone else might have created 2000 mile markers further up along the trail. By now, depending on the maps one used, the 2000 mile mark could be anywhere within the next five to ten miles. I arrived at Santiam Pass and Highway 20 early in the afternoon. 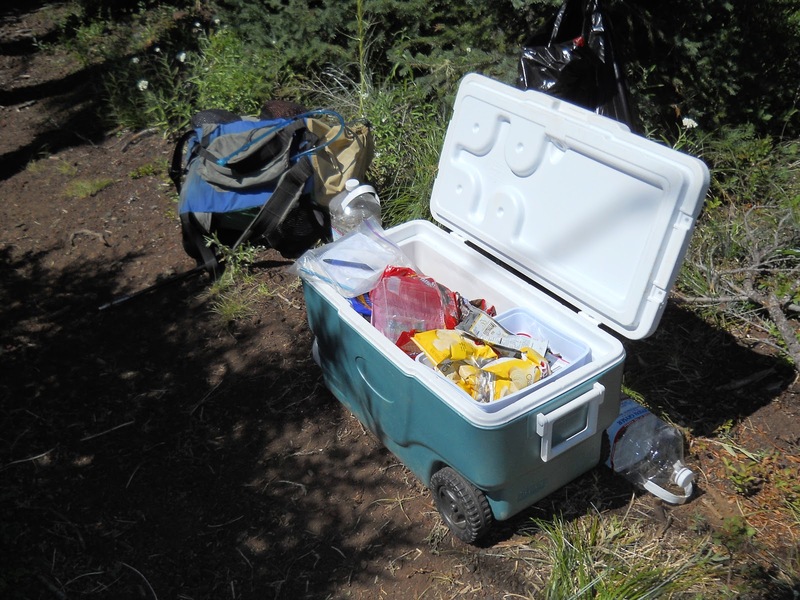 Trail magic was left in an ice chest near the road, and I went ahead and enjoyed its contents and signed the register with it before going up to the road and try to hitch a ride. 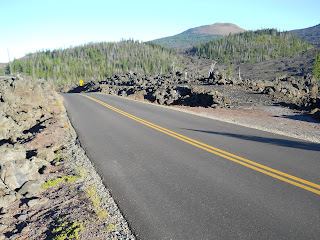 This road was significantly busier than McKenzie Pass, and I figured it shouldn't take long to get someone to offer me a ride. Just the sheer numbers of people driving by would almost guarantee a ride fairly quickly. I set my pack down by my feet, but kept my trekking pole out as each car drove by. I didn't know if the trekking pole would help or not, but I figured it didn't hurt and maybe it would help identify me as a real hiker rather than a homeless person or wacko for being out in the middle of nowhere. And since I had nothing better to do while standing in the sun, I counted each of the cars driving by. After about a half hour, precisely 134 cars drove by, before cars #135 and #136 pulled off on the side of the road about a quarter mile past me. Clearly, the two cars were traveling together, and clearly they didn't pull over to pick me up since they had already drove a quarter mile past me before they stopped. I figured one needed to stop for some reason or another (maybe to pee, maybe to talk to the people in the other car, or whatever). I watched the figures exit their cars and start conversing a bit, and I considered walking up there to ask if I could get a ride into Sisters. It's a lot harder for people to say no right to your face than it is to drive by at a high rate of speed. But I also didn't want to walk the quarter mile up the road just to be told that no, they wouldn't give me a ride. mountain in the back is Mount Jefferson. Then I noticed one of the figures waving--seemingly at me. Hmm.... Surely they couldn't be waving at me? Well, I figure, there's nothing to lose by walking over and see what's going on. I picked up my pack and walked to the cars. 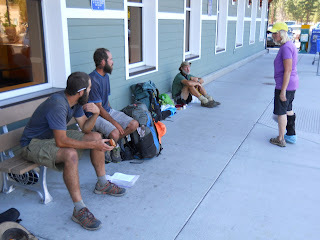 It took a good five minutes or so to reach them--I wasn't going to run with my heavy pack on, that's for sure! And when I arrived, they offered me a ride the 15 miles into Sisters. I was thrilled! The guy in one car seemed hesitant about hiking up a hitchhiker, but his friend tried to explain, "He has a trekking pole! It's a hiker! We have to pick up hikers!" (And I was sooo glad I was standing around with my trekking pole visible!) They were driving out to Bend, and would be passing directly through Sisters. Yes! I hopped into one of their vehicles and was on my way into town. I had them drop me off at Rays Supermarket. I didn't know where I'd be spending the night, but I knew I needed groceries, so I figured I'd start at the supermarket. There I bumped into Red Head, Just Dave, and Double D--the first time I'd seen them since we parted ways at the empty water cache, and I finally heard that they had decided to take the alternate route. 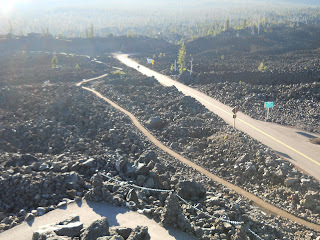 They got a ride into town from McKenzie Pass, so I was still ten miles or so ahead of them on the trail. Red Head was planning to meet his sister and was trying to coordinate things there. While chatting, one of the employees at Rays came out and gave all of us extra donuts. Sweet! They were so friendly out there. =) A customer leaving the store talked us up a bit, an older lady, who asked if there was anything she could do for us. I didn't need anything, but the rest of them managed to score a ride to where they were supposed to meet Red Head's sister. I did it! Two thousand miles!!! I did my grocery shopping, then hoofed over next door to the Sisters Inn and Suites where I checked in. I asked about laundry facilities and were told they had none on the premises, but that there was a laundromat further into town. 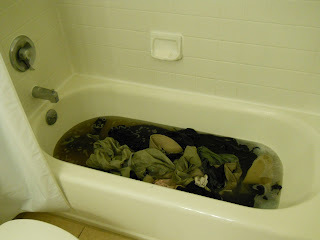 It was fairly late in the afternoon by this point, and walking a mile into town to do laundry didn't appeal to me, though, so I washed my clothes in the bathtub instead, then hung my clothes to dry all over the room. =) I'd been carrying those little packets of laundry detergent that can be used to wash things in the sink, but I had far too many clothes and too much dirt to rely on a sink. And I had three of the little packets I'd been carrying ever since the Mexican border. No more! Nope, I'd use them all to wash my clothes in the bathtub. talking with a trail angel who would give them a ride later. "if all your clothes are in the bathtub, what are you wearing?" Uh, ya. Pass the Eye Bleach eye patches please. whew, that was close. Sure am glad I have my Eye Bleach patches handy, I could of been blinded for life. Sounds like yesterday's 10 mile "detour" was a lot less like a history and geology lesson than your shorter hike to the Observatory. Lots of fascinating history you shared with us, too.